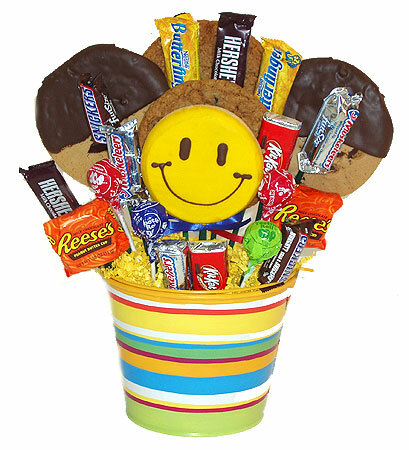 A colorful edible bouquet made up of a delicious assortment of gourmet cookies and popular chocolate candy bars. This cheery arrangement includes a variety of our huge gourmet cookies including Chocolate Chunk dipped in Chocolate, Old Fashioned Peanut Butter dipped in Chocolate, Oatmeal Raisin Cinnamon, Snickerdoodle, and a smiley face shaped iced shortbread cookie. To all of that we add everyone's favorite fun size chocolate candy bars including Butterfinger, Hershey's Chocolate, 3 Musketeers, Kit Kat, Reeses Peanut Butter Cup and Tootsie Pops. Sure to bring a smile to their faces!